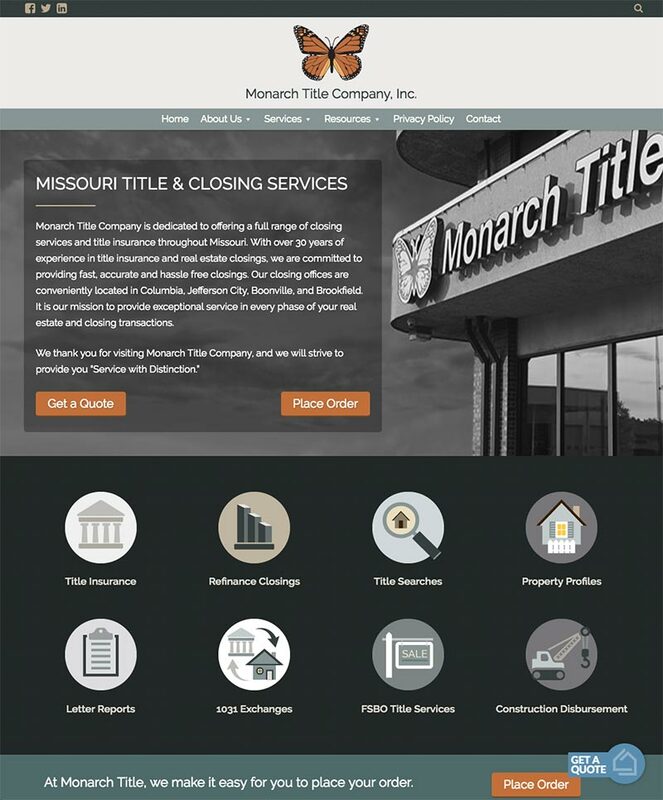 Monarch Title Company is a full service closing and title insurance company headquartered in Columbia, Missouri with three other locations across the state. Monarch is the number two title company in Columbia by size. Although business is based heavily on relationships and referrals, Monarch realized that to maintain market share and grow, it needed to build a web presence – even as a B2B service. Research indicated high search volume for industry-related keywords in our market, further affirming the need to grow in the digital space. Launching a redesigned website for Monarch Title Company delivered almost instant results. The old, non-mobile-friendly site delivered no leads, but the new site with a refreshed logo and strategic calls-to-action began sending leads to Monarch immediately. CMG attacked the redesign with SEO in mind from the start. Keyword research drove content development, and CMG’s development team built the site with meticulous coding and added speed enhancers to reduce load times. After launch, the heavy SEO work began. Extensive on-site and off-site tactics were implemented, tracked, and tweaked. In the first and second month, there was upward movement in rankings. In the third month, organic traffic to MonarchTitle.com grew 24%. Monarch’s improved digital presence is growing their business and has solidified their presence in the Columbia market.